My teaching experience of 10 years has been varied and rewarding. I have been teaching Short Courses at Central Saint Martins since 2007. As an initial point of entry for many students, it has been a rewarding experience helping prepare many students for their degree programmes. I have worked with students who have gained a place at CSM and other schools in the UK: Goldsmiths, Architecture Association, University of Edinburgh, among others. Since 2006, I helped develop and deliver a manual skills drawing programme for architects and engineers for Drawing At Work. I have taught at leading offices in London, most recently working with over 200 architects at Foster+Partners. For CSM Short Courses, I also developed an Art & Design Summer School for teenagers (13-15 and 16-17) which I have delivered since 2009. I started teaching online Short Courses at CSM in 2014, and since 2015, I deliver bespoke training for professionals (architects and engineers). 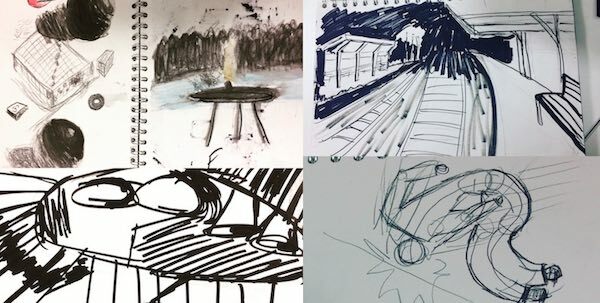 For University of the Arts London, I worked with Chris Koning on the Widening Participation Drawing Qualification, teaching in Newham and Camberwell, and since 2015, Chris and I developed and delivered Thinking Through Drawing UAL-wide workshops for UAL Academic Support. I took over running these workshops since 2016, and I have worked with over 100 students from Foundation to Research across the six UAL colleges. Based on this work, Chris and I have been awarded RAS (Retain-Achieve-Succeed) research funding to investigate drawing as a necessary skill for creative activity. I have been invited to deliver workshops for a broad range of students and professionals, including urban planners, public sector practitioners, portfolio preparation students in Shanghai and Beijing, landscape architects, film production design students and primary school children and teachers. Each year over 12,500 students of all ages and abilities come from around the world to be taught the Central Saint Martins way of thinking creatively through practical experimentation using traditional craft skills alongside modern technologies. 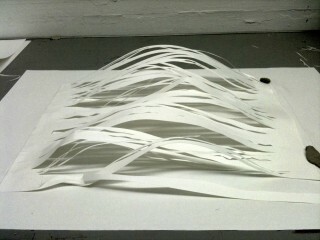 I have taught Short Courses at Central Saint Martins in drawing, creative process and portfolio preparation since 2007. I started teaching online Short Courses at CSM in 2014, developing an online version of the Total Drawing course. My students are worldwide: from the Bahrain, the Congo, France, Greece, India, Ireland, Italy, Japan, Malaysia, Norway, the Philippines, Saudi Arabia, Singapore, Spain, USA, the UK, etc. Below is a list of these courses with links to course descriptions and images of work made during the courses. Since 2015, I deliver bespoke training for professionals (architects and engineers) and special events workshops for example, for the Affordable Art Fair London in Battersea Park. In 2015 I developed two three-hour workshops for UAL Academic Support with Christina Koning, to revisit drawing skills and consider what it means to ‘see skilfully’. Between 2013 and 2014, I taught part of the Level 2 Drawing Qualification through a University of the Arts Widening Participation and Progression initiative. 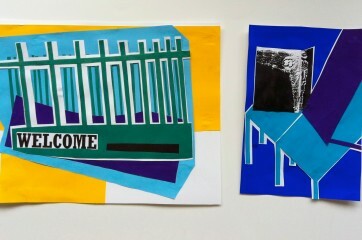 Read more about this course on the CSM Short Course Blog. Just to let you know I made in into the BA in Architecture at CSM and Foundation at the AA, and will be going to AA. – Student 2011. This is a solid creativity, skills and idea development course, which I started teaching in 2015. Students from this course have developed their portfolios and gone on to gain places at different universities. My students have been from Aberdeen, Athens, Bahrain, Colombia, Delhi, Dubai, Frankfurt, London, Los Angeles, Madrid, San Francisco, Saudi Arabia, Scotland, and Wales. Full course description and booking information. · Very well suited to beginners as well as those who have drawn before. · The tuition was superb, with good clear instructions as well as teaching me actual basic academic techniques such as perspective which has proved enormously helpful and will be useful when I am drawing on my own and how to translate what I am seeing on to the page. 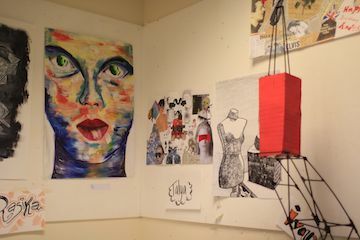 · The structure of the classes was superb from the still life on Day 1 through to drawing at the British Museum and also outside on the street finishing with a creative session. I am surprised and very pleased at how much we covered. · Very pleased with the amount of different drawings I came away with. I developed an online version of the Total Drawing course which first ran in 2014. My students have been in Barcelona, Birmingham, Bulgaria, France, Greece, Kinshasa, Ireland, Japan, London, Malaysia, Norway, the Philippines, Rome, San Sebastian, Singapore, and the UK. Ilga’s Total Drawing class is an excellent and enjoyable way to learn or re-visit the basic skills, techniques and mind set of drawing, whatever your past experience’. – Jim 2014, UK. I developed the pilot for this course in 2010 and it ran for five consecutive years in the Buckinghamshire countryside. My daughter came back home safely and was extremely happy and enjoyed her studying on the course, she was reluctant to come back. We were amazed to her attentive and dedicated working spirits. We appreciated your teaching and inspiration very much! – Yu Lei 2013. Building on the success of the first course for 13-15 year olds, I developed another course, this time, art and design, for the same age group. It has run every summer since 2013 with multiple groups of 13-16 year olds alongside a fashion course in the nextdoor studio. I have been invited to consult and deliver workshops for a broad range of students and professionals, including urban planners, public sector practitioners, portfolio preparation students in Shanghai and Beijing, landscape architects, film production design students and primary school children and teachers. I also work privately one-to-one, online and in person. Please send an email to discuss. I was invited to teach drawing to a small group of MA and BA Film Practice students who are specialising in Production Design. The BA course at London College of Communication is a general film course at the beginning, and then towards the end of year 2, students start to move towards specialisms. The advice given from visiting production designers is to get the students comfortable to communicate their ideas through drawing. The MA course was newly set up this year. I ran five weekly sessions covering drawing basics and materials. Thanks to Polly Nash for inviting me again to work with a wonderful group of students! Image credit: student drawings. I ran a drawing workshop for Future of London‘s new Leaders Plus participants. I had worked with previous groups over the last two years and it was a pleasure to be invited back again this year. Deptford is the current case study. 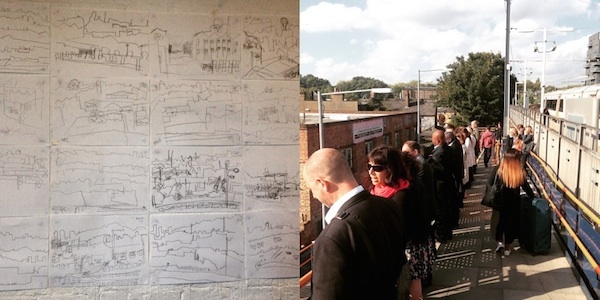 Jeff Endean, of the London Borough of Lewisham, gave an overview of the masterplan and a walking tour of the area, and I led the group through two different drawing exercises focussed on looking. 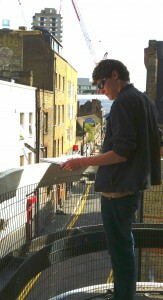 A beautiful morning, followed by a group discussion and mini exhibition at Deptford Lounge. Image credit: The workshop and participants’ drawings. Drawing, Painting, and Process course with Pringle Richards Sharratt Architects. I ran seven sessions for Pringle Richards Sharratt Limited, an architecture office based in Kennington. It was a pleasure to return for a second time and work with such a talented, enthusiastic and welcoming group! Thank you to Joana for organising the sessions. Image credit: student drawings. I taught drawing basics to year 5 and 6 pupils at Cobourg Primary School over the autumn term. It was an after school enrichment club and my third time working with nine and ten-year-olds. Over eight weeks we looked at drawing the still life, portrait, perspective and figure basics. It was a wonderful experience and the children I worked with were very enthusiastic and dedicated! An exhibition of the drawings at the school, followed in the new year. I submitted two of the children’s self-portraits to the Peckham Platform Open15, an opportunity to celebrate all things creative in Peckham, inviting people that have a connection to Peckham to contribute artworks to exhibit together at Peckham Platform. Thanks to the great turnout in support of the children, they took first and second places for the Public Choice Best in Show Prizes! Thank you to everyone who voted. Image credit: student drawings. I was invited to teach drawing to a small group of Film Practice students who are specialising in Production Design. The BA course at London College of Communication is a general film course to start with, and then towards the end of year 2, students start to move towards specialisms. The advice given from visiting production designers is to get the students comfortable to communicate their ideas through drawing. I ran three weekly sessions covering drawing basics and materials. Thanks to Polly Nash and the wonderful group of students! Image credit: student drawings. Urban Drawing Workshops for Future of London Leaders Plus career development for public-sector practitioners, Hackney Wick Fish Island. 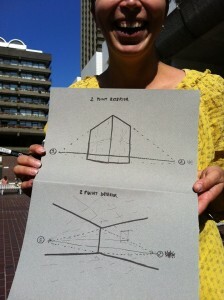 I ran a drawing workshop for Future of London‘s new Leaders Plus participants. I had worked with the previous group last year and it was a pleasure to be invited back again this year. Hackney Wick Fish Island is the current case study. The London Legacy Development Corporation gave a walking tour of the area, and I led the group through two different drawing exercises focussed on looking. A beautiful morning followed by a group discussion. I also ran a team building drawing exercise in Peckham, South London, for the Future of London office.Image credit: The workshop and participants’ drawings. 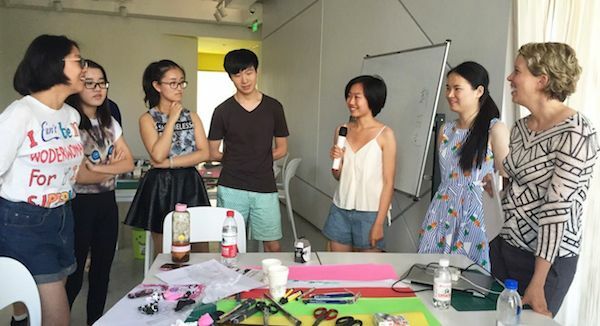 Design Master – Beijing Anostar Education, Shanghai and Beijing, China. I was invited to China to run workshops in Shanghai and Beijing at Sphinx International Art Education, an organisation that does a wonderful job preparing students for studies in Europe and North America. 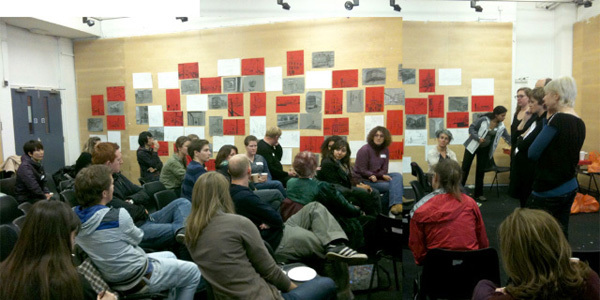 I ran creative process and idea generation workshops, working with four groups of students at different levels of study. I also ran personal tutorials, giving advice on students’ work and portfolios. It was an amazing opportunity and I learned so much! Thank you to everyone I met, in particular Gonny and May Li for organising the events and inviting me! Experimental Life Drawing at Vogt, Landscape Architects. 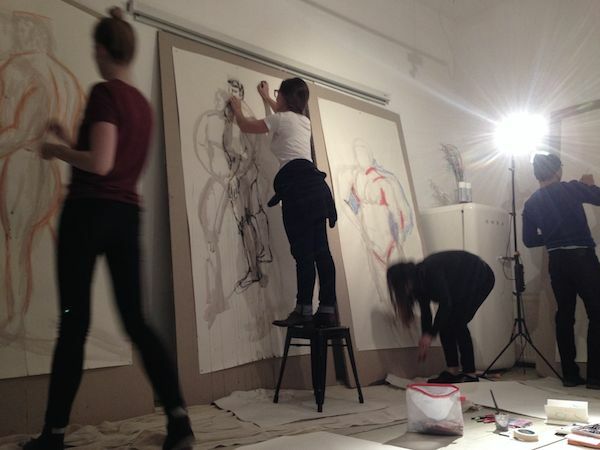 I ran a set of four experimental life drawing sessions for Vogt, a landscape architecture office based in Shoreditch. It was a pleasure to return to this office for a second time and with such a talented, enthusiastic and welcoming group in their extraordinary railway arch space! Thank you to Chloe and Kate for organising the sessions and our great models. Image credit: student drawings. In October I ran two urban drawing workshops for Future of London: new introductory sessions to their Future London Leaders and Leaders Plus career development programmes. The workshop focussed on the process of looking, rather than the output. 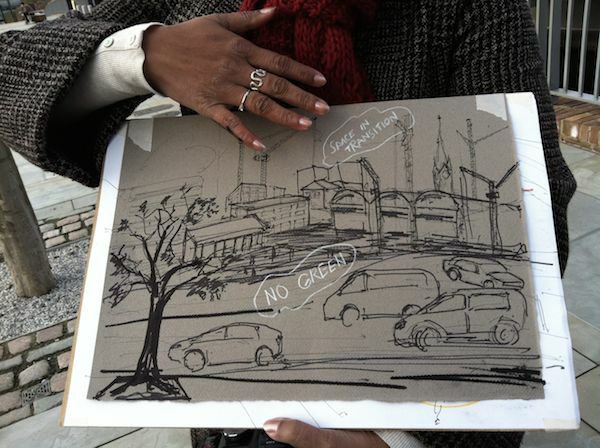 How can drawing be used to communicate the urban environment? 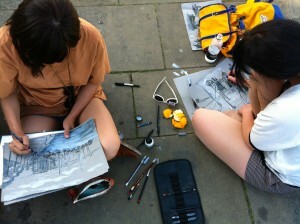 What do you observe and learn about the city through drawing that you hadn’t noticed or acknowledged before? The candidates were encouraged to stop and see an area undergoing significant change. They were taken out of their day-to-day mindset and their comfort zone, and when reviewing all the drawings together, it was clear how different people’s perceptions of the same place can be. The workshop for 20 Future London Leaders candidates took place in their own neighbourhood: Farringdon. Beginning atop the Alan Baxter & Associates building on Cowcross Street with an introduction from Alan Baxter, candidates captured the city skyline before moving to Farringdon station, and later to Smithfield Market. In debriefing after three exercises, many candidates picked up on how quickly they got past the chaos of rush hour (and the eyes of onlookers) to focus on the exercise; as one participant put it, “you never get the chance just to look, hard, at the city”. For the Leaders Plus candidates, their first look at the Old Street Roundabout, which will serve as a case study for the programme. Following short context presentations at the start by LB Islington’s Eshwyn Prabhu and David Jowsey from Transport for London, I led the group of 20 through three drawing exercises, getting them to look, and see this chaotic place in a fresh light. One of the comments was how crowded the area reveals itself to be, with ’street clutter’, bollards, posts and signage, as well as traffic. 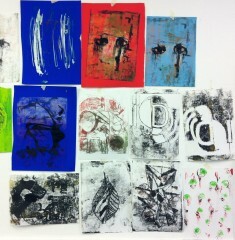 The morning session ended with a review and discussion, looking at the work and exchanging thoughts about the process. 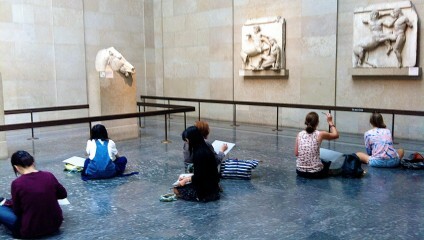 Read more about drawing and seeing the city in this blog. Photo credit: Future of London. 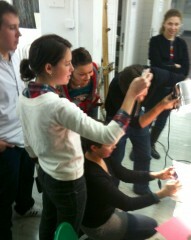 I ran a set of four experimental life drawing sessions for Vogt, a landscape architecture office based in Shoreditch. It was a pleasure to work with such a talented, enthusiastic and welcoming group in their extraordinary railway arch space! This guided walk for the 1st International Conference on Urban Sustainability and Resilience stopped at key points of interest in the transformative geography of the city, near the King’s Cross area of London. Key landmarks, buildings, intersections, junctures and other miscellaneous points of social, architectural and historical significance provide the setting for impromptu drawing sessions led by Ilga Leimanis, of the collaborative, mobile and performative drawing duo Ortelius Drew. This tour encouraged participants to see how the act of drawing with others demonstrates the extent to which each individual sees something different whilst exploring the same scene. Each drawing is unique, thus representing a diversity of viewpoints and understandings of urban change. I ran an INSET training workshop for teachers and teacher assistants on teaching drawing at Macaulay Church of England Primary School. The one hour 15 minute workshop ran through practical exercises building confidence in drawing from observation and developing ideas through drawing, stressing the importance of using drawing as a tool for communication. Drawing DiverCITIES is a Walk-Talk- and -Draw event that took place on Friday the 29th October 2010 from 10am-3pm. It encouraged new MSc. Urban Regeneration students from the Bartlett School of Planning and local community groups to share perspectives on the transformation of the King’s Cross area through the communicative act of drawing. Dr Susan Moore and Dr Nikos Karadimitriou from The Bartlett School of Planning organised this event. No previous drawing skills were required. The emphasis of this event is on the sharing of ideas, reflections, interpretations and meanings embodied in the urban transformations affecting our shared local community and about using drawing as a tool for communication and sharing ideas and concerns. It is a unique opportunity for community residents, activists and other interested individuals to interact with future planners and regeneration practitioners and to share their experiential knowledge of urban change and the everyday impacts of planning-in-action. The intention is that the students will also gain a valuable insight into the need to be sensitive to local perspectives and enhance their abilities to communicate effectively with local residents and stakeholders. I was lucky enough to attend the King’s Cross drawing ‘expedition’ you provided through Susan Moore and the Bartlett (UCL) in autumn 2010. I loved it as a way to check perceptions of a regeneration area, and have never forgotten it. It’s actually one of my all-time favourite learning experiences. – Lisa Taylor, Director, Future of London 2014. Ilga’s tuition at KPF soon became the highlight of my week and I’ve directly recommended her to countless people. Her lessons were a great release from the deadlines of the office yet remained challenging, invigorating, and far more rewarding than doing it by myself. Her nudges at the right moments made the difference between shredding my sketches or pushing it to become something special. Ilga’s teaching-touch is casual and did me well – I recommend her classes to everyone. – David Moore 2011. Between 2006-2008, I took part in all DAW tutor training days for research and development of the Drawing At Work programme. These research and development days were fun and shambolic, where we set up a laboratory of sorts, testing out and experimenting with new ideas. The training days took place about six times per year where we’d run through exercises from our existing courses. Between 2006-2008 I was Course Manager for Drawing At Work. 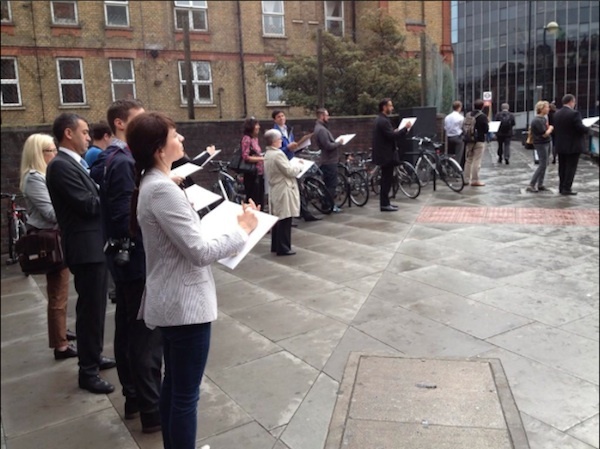 I worked together with the Campaign For Drawing coordinating and facilitating two large Big Draw launch events at Bishop’s Square, Spitalfields and Covent Garden in 2007 and St Pancras in 2008. Over the three dates, 900 members of the public were attracted to take part in DAW’s all-day architectural and townscape sketching sessions. Our teams of volunteer ‘expert drawers’ were made up of architects and support staff from the various practices where we teach. Since 2010, I have been offering individual tuition to those who want to learn how to draw and develop their skills on a one-to-one basis. I also offer consultations for portfolio review, and have worked with students who need extra assistance with their studies and University projects, or who want to develop their skills to a higher level. To date, I have worked with architects, interior designers, jewellery designers, illustrators and fine artists. I charge a rate of £55/hour and the minimum session is 2 hours long. I usually work with a few students per term, either in person or online, please contact me to arrange an initial chat and discuss your plan.